There are immense of the scenarios where Lotus Notes users prefer to take away their emails from Lotus Notes NSF files into MBOX file format and Sysessential for NSF to MBOX converter applicable works superbly in this regard. One of the biggest botheration is data safety and this NSF to MBOX export utility always maintains. It always ensures that data is exported in the safe and absolute manner. There are so chances like virus issues and so on while data is migrated. The application is supportive of making complete email data migration from Lotus Notes NSF files into MBOX file format. It works absolutely so well when it is to convert mailbox of Notes such as Inbox, Drafts, User Defined Folders, Sent Items and so on. Software offers a short summary in regard to the details of the NSF folders. This includes number of folders imported, email count, name of the migrated files and so on. This unique software solution maintains folder mapping option. It helps to easily map Lotus File with Inbox in the new MBOX file. This help users in the long run when they need to access the folders. 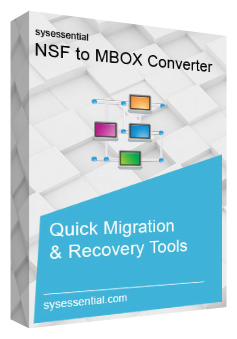 NSF to MBOX converter allow users to convert not just single NSF file into MBOX but multiple NSF files with ultimate safety. This feature offers instant and easy migration from one end into another. The application is helpful when it is to maintain folder hierarchy. All the folders as well as sub folders preserved in the specific destination will move into safely into MBOX file format safely. Is software easy to perform? Yes, the tool is easy to implement in functionalities. Users just have to install the application and rest the tool will do. It will start making email data migration from NSF files into MBOX seamlessly. Does software support to work with all Lotus Notes editions? While creating the application, software developers ensures that users do not face challenges due to support to specific Lotus Notes editions and this is why works in compatibility with all the Notes versions. This definitely provides ease to users as they hardly need to think about specific editions prior purchase of the tool. What is the software capable of in freeware demonstration run? Free trial run is like testing the functionality of the software before finalizing the purchase version. Just click the Download Now button and this will lead to show the process of converting NSF files into MBOX file format. The demo run will convert first 10 emails from NSF files into MBOX. This will help you in evaluating the functioning of the software. How to catch help when come across some technical issues? Though Sysessential for NSF to MBOX software has advanced algorithms and thus no troubles seen, but if you find any undue hurdle then connect with the support team and seek adequate help from Support guys. They are proficient and have immense of the expertise when it is to rectify any query. You can call them round the clock or can send an email as well. Yes, the application has simple user-interface thus no more troubles experienced. Even if you have lesser technical skills, you can run the application swiftly and seamlessly. Thus buying of the tool does not affect working at all. Be rest assured for catching the tool anytime and tool will commence email migration from NSF files into MBOX without a delay. Is email migration process hassle-free? Will I be able to access data in proper folders as they were placed in Lotus Notes? There is nothing to get worried! Software cares for your data and ensures that you face no hassles while migrating data. Also, folder structure is equally maintained when data is moved into MBOX files. You can view them and feel comfortable to work with them. I am supporter of Lotus Notes from the beginning. But slowly and gradually, its high cost start pinching me and I started looking for some affordable email application. There are many emailing applications but I found Mozilla Thunderbird to be one of the excellent client to work with. The troubling part is that now I don’t know how to move emails from Lotus Notes into Thunderbird. One of my clients recommended me for Sysessential for NSF to MBOX Converter. I tried demo run and found application perfect o shape in my demand. It exported all the emails safely and completely into MBOX files. This made it possible for me to access emails clearly. Thanks a ton for such a software product. I am new to software products and when I used Sysessential for NSF to MBOX Converter, I was little bit perturbed. But to my surprise, support team of the company is so co-operative and helpful they without getting irritated over my queries they answered all in the apt manner. Now, I am able to access my emails from NSF onto MBOX file format. I asked multiple questions prior buying and after purchase of the too, they answered so accurately that I hardly faced any issues while commencing the data migration.